Do Non-surgical Treatments Help Maintain Megan Gale’s Youthful Complexion? 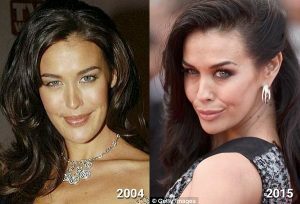 Megan Gale, has long been an advocate for aging gracefully, speaking openly about her views on plastic surgery and why she has chosen not to go under the knife. Beverly Hills plastic surgeon Dr. Randal Haworth has weighed in on Megan’s age-defying appearance. ‘I understand Megan has denied “going under the knife” and, based solely on her photographs, I tend to believe her,’ Dr. Haworth told Daily Mail Australia this week. Dr. Haworth, who has not treated Megan himself, described several small, non-surgical procedures she may have undergone to maintain her supermodel look. Haworth also believes that Megan may have had some Botox ‘here and there’ to subtly smooth out her crow’s feet. Megan has spoken candidly about her attitudes toward cosmetic work in the past. In 2016 she told New Idea in 2016 that she would never consider surgery as her former AFL star partner Shaun Hampson, 30, would ‘kill her’. Megan, who previously dated radio personality Andy Lee, is one of Australia’s most successful fashion exports. Throughout her career, she has graced the covers of countless magazines, including Marie Claire, InStyle, and GQ Australia.